What is the Highlight of a Mississippian on Vacation? How much do you know about Mississippi culture? My family on both sides has been in Mississippi since before the Civil War. My mother is a retired Mississippi history teacher. I thought I was observant and knowledgeable about all things Mississippi. But sometimes it takes someone not steeped in the culture, not raised with deep roots in the state, to notice the characteristics of our culture. For example, Alexis de Tocqueville’s classic text, “Democracy in America,” is full of accurate descriptions of American life in the first half of the 19th century made by a visiting Frenchman. Enter my new friend Gary. He is from Chicago, married a woman from Winston County and has lived in Jackson for about 15 years. He sees Mississippi through an outsider’s lens, and has lived here long enough to analyze our native ways. Gary now loves Mississippi and made several observations about our state that are spot-on. First, he asked me, “What is the highlight of every Mississippian’s vacation? It’s seeing another Mississippian while on vacation.” After thinking about it, I realized he was right. If you are from Mississippi, you always enjoy meeting another Mississippian when you are traveling. 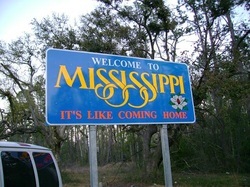 It’s been said that Mississippi is not a state, it’s a social club. When we are out of state and meet another member of the club, it is exciting – like seeing family. You’re smiling as you read this because you know it has happened to you. I remember once when a car with a Mississippi license plate turned into the same apartment complex as me in Washington, DC. I rushed inside to share the same elevator and see who it was. That’s how I met James Meredith, who integrated Ole Miss and at the time was working for Senator Jesse Helms of North Carolina. Gary said that in Mississippi, people respond to questions differently than where he grew up. In Chicago, if someone asks, “What are you?” then the likely response is Polish, German, Irish and so forth. He observed that in Mississippi, when asked what you are, people respond, “I’m Baptist or I’m Chi Omega.” I would add that some respond, “I’m Ole Miss or I’m State.” Again, his observations resonate because they are dead-on accurate. There is one Mississippi trait that I didn’t need Gary’s help to perceive: we are all connected by people we know across the state. It’s a kind of Mississippi kinship. In Mississippi, the first question we ask is not what you are; it’s “Where are you from?” That’s because it is more likely than not that we’ll make a connection once we pinpoint each other’s geography. Sure enough, Gary’s wife Lee Ann told me she was from Louisville but her mother was from Brandon. No sooner had I told her that my mother’s hometown is also Brandon than we figured out my aunt was a bridesmaid in her mother’s wedding. Again, anywhere else this might seem exceptional, but in Mississippi, it is the rule. In a way, everybody knows everybody. (Visit the Neshoba County Fair any year to see this trait on steroids). That’s the way we like it, and it’s why we are the Hospitality State. So the next time you’re on vacation, keep a lookout through your cracked windshield for your fellow Mississippians. It will be the highlight of your trip!